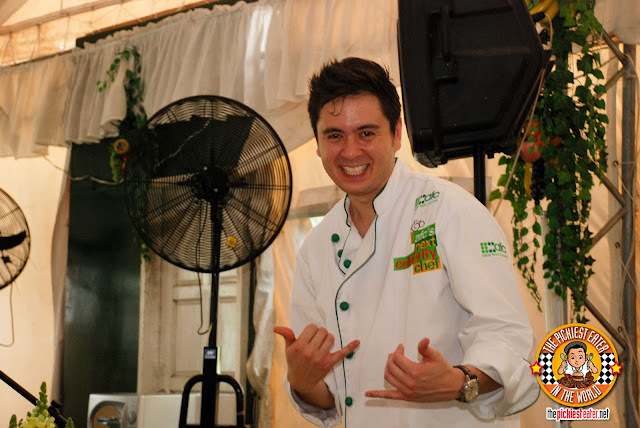 THE PICKIEST EATER IN THE WORLD: AFC'S "NEXT CELEBRITY CHEF" WINNER DINO FERRARI AT MERCATO CENTRALE! AFC'S "NEXT CELEBRITY CHEF" WINNER DINO FERRARI AT MERCATO CENTRALE! Because of my line of work, I rarely get starstruck. My boss is a prominent figure in the entertainment business so it's not anything out of the ordinary for me to walk into his wife, and find him talking in an intimate meeting with a celebrity. I've met a lot of celebrities over the years.. movie actors, professional athletes, both local and international (Wait.. does Keith Martin still count as "international"? ), but no one ever truly fazed me. 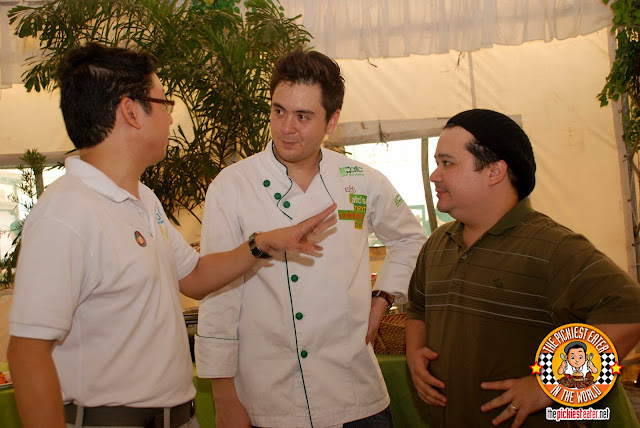 Becoming a blogger, however, has turned me into a fan boy of celebrities from the culinary world. So when I found out that Chef Dino Ferrari, the winner of Asian Food Channel's "Next Celebrity Chef" was going to be doing a cooking demo at Mercato Centrale, I knew that I couldn't miss the opportunity to meet him in person. My greatest moment in my Twitter career was when I got a tweet from these two men.. I think you might know the first one..
Uh-huh. You read that right. Gordon Ramsay. Tweeted ME. In case you were curious, my complete tweet was, "I wanted to name my daughter "Barbara Consuela" so her nickname would be "Bacon" but my wife won't let me.. What are your thoughts? ", and yes, he answered that he wanted to name his son, "Basil". I tried showing this to Rina to overturn her veto but to no avail. Which is ok because "Rain" is still a beautiful name. Sadly, he never replied to my tweet asking him to be Rain's Godfather. Oh well. The other celebrity that tweeted me, was my idol, and inspiration for my blog, Adam Richman. I got a simple "LOL" from him, but still, it made me feel warm and fuzzy inside! Oh and for some reason, the great Andrew Zimmern from Bizarre Foods is actually following me on Twitter (account verified)! When I saw Chef Jackie Laudico during my visit to BFast last year, I didn't care if she was having breakfast with her son. I just HAD to get a picture with her. And I can't forget how I got butterflies in my stomach when RJ Ledesma of Mercato Centrale went up to me during one of my many visits to tell me he enjoyed reading my blog! We've been twitter buddies ever since (I'm straight, I swear). Despite getting home late from work last Friday night, I got up early on a Saturday morning to meet Chef Dino. Rina, who's working the late night shift from her home based work, said that even though she went to sleep at 6am, she still wanted to go as well (And the moment she set her eyes on Chef Dino, she decided she made the right decision). We got to Mercato Centrale at just the right time, because Chef Dino was still setting up his make shift kitchen on the stage. What is it with women and Chefs though? 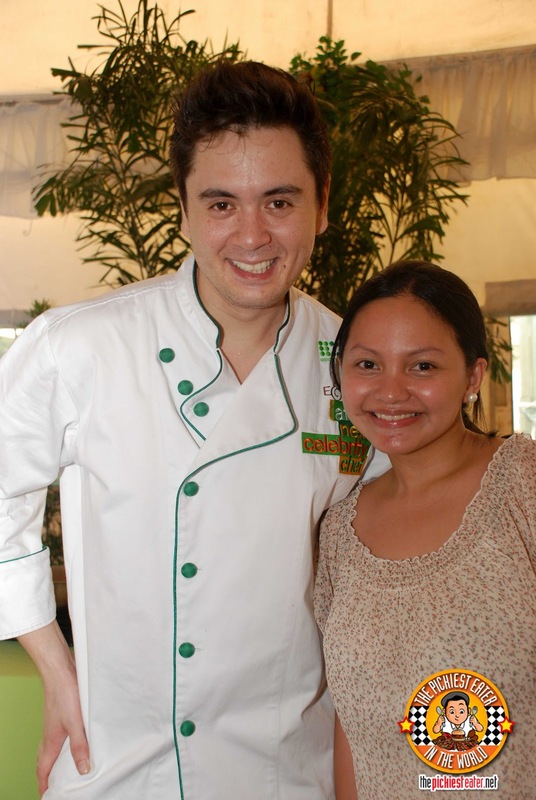 Rina had no idea what Chef Dino looked like, so when I saw him inside the tent, I asked her, "Do you find that guy good looking?" She goes, "Yeah he's cute, I guess. Why? Who is he?" So I say, "That's Chef Dino." She stops and says, "THAT'S Chef Dino??" I nod and say, "Oh my god he's so cute!". 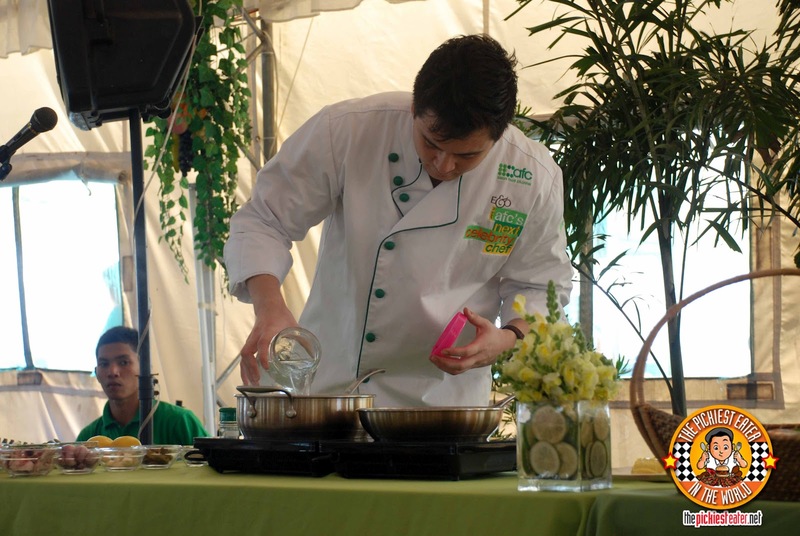 She also thought it was adorable when Chef Dino took the microphone from RJ to announce that the demo is going to start a little late because he was waiting for his mom to arrive with some equipment he needed before he could start. After Chef Dino's announcement of the demo starting a little late, I told Rina that I would go out to check out the food stalls for a little bit. She said she'd just wait for me inside the tent to save our front row seats. I go around the vendors area for a few minutes, and decided to head off back to the tent. Much to my surprise, my wife was no longer in her seat, and in her place was our stuff. Apparently RJ said that Chef Dino would be going to Mercato Centrale's Organic Market to shop for some fresh produce for the demo, and if anyone would like to join him, they should feel free. So in other words, I turn around for one second, and my wife runs off with Chef Dino. 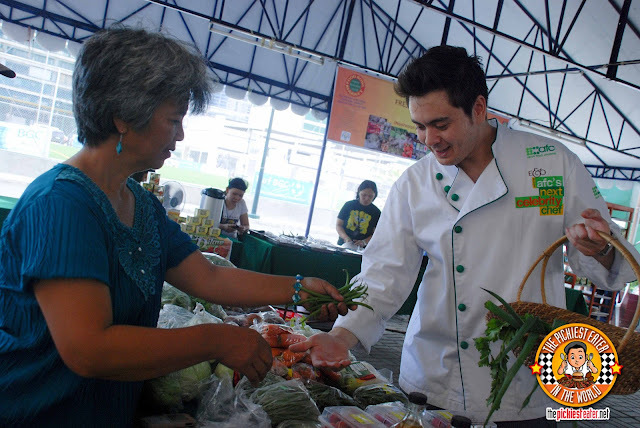 For those of you that enjoy fruits and vegetables, you'd be hard pressed to find a better and fresher selection than Mercato Centrale's Organic Market. 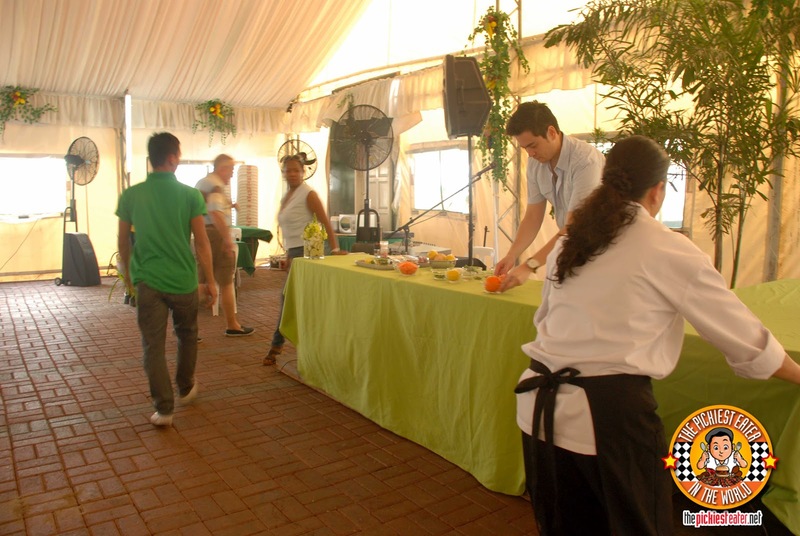 Suppliers from all over the country bring in their fresh produce to the big city, in an effort to promote a healthier lifestyle and food choices. Chef Dino explained that he'd be doing a live demo of how to cook two chicken dishes, using two different techniques- One through Poaching, and the other through roasting. Also, "Free Range Chicken" from Pamora farms were used. I finally found out what Free Range chicken means! Rj explained that chickens are usually kept in tiny cubicles together in a poultry farm. "Free Range Chicken" means that they aren't cooped up, and are allowed to roam around the farm.. hang out with their friends.. chill out.. watch movies... No curfew. Or something to that effect.. Umm.. Again, the bottom line is they're not cooped up in a confined space. 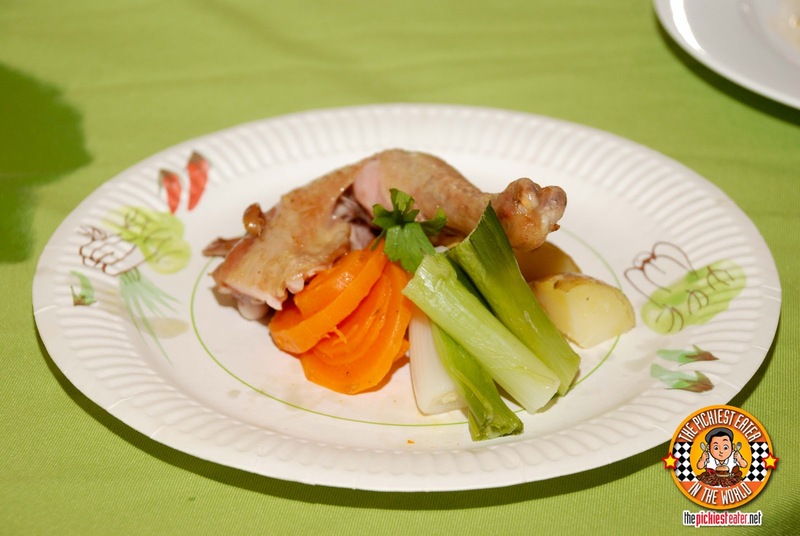 The chicken was inserted into a zip-loc bag (by Chef Dino's assistant, Ate Baby), filled with water and dumped into a hot water bath until the meat cooked to beautiful white color. As juicy as the chicken was, the cream sauce is what totally made the dish for me. I was sitting in the front row, and even from there It smelled incredible. I was tempted to steal that large glass jar he was holding up as a sample. 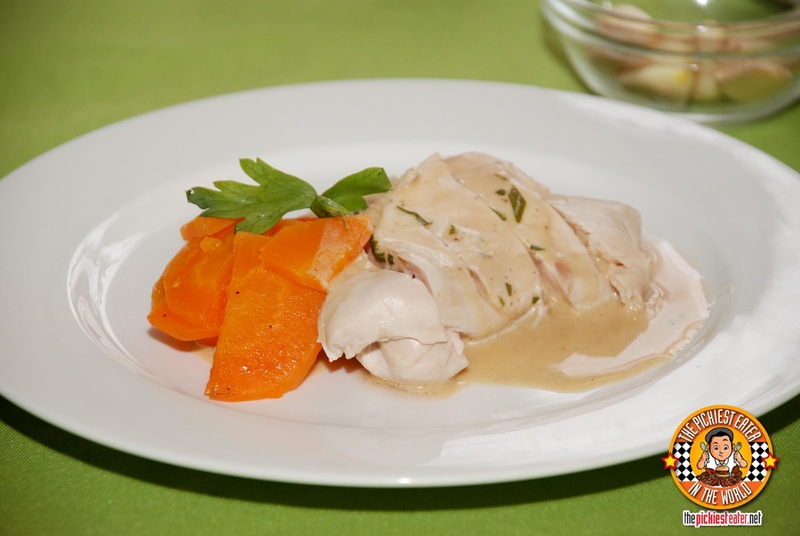 The poached chicken dish is something that could be done in around 30 minutes, and is absolutely delicious. I was pleasantly surprised to bite into the carrots and actually enjoyed it. It was soft and sweet, and was a perfect garnish for the chicken. As soon as Chef Dino shares the recipe on his facebook account, I plan to post it here as well. Chef Dino though, wasn't done yet. 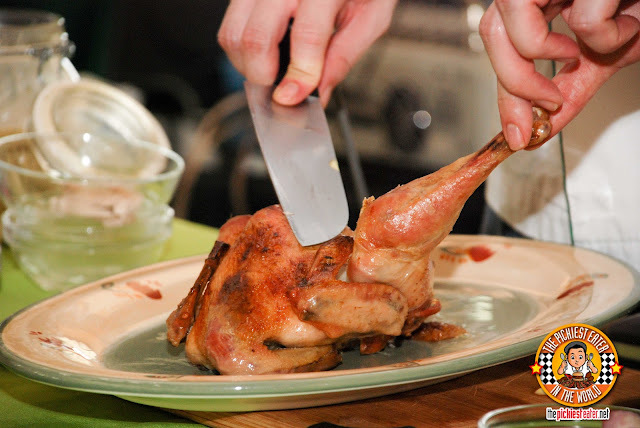 He whipped out his roasted chicken, which was cooked to an amazing golden color. His advice was to cook it at 100 degrees at an hour and a half, which based on his experience is just right. Judging by the ease of how he sliced through the chicken, he was right on the money. The chicken was cooked perfectly, with the skin cooked to a golden crisp, without trying it out. Leaving the chicken in the oven for a longer time at a lower temperature ensured that all its natural juices were still locked into it. Between this and the poached chicken, its a toss up, but I enjoyed the roasted chicken more, and the cream sauce worked well with it wonderfully. 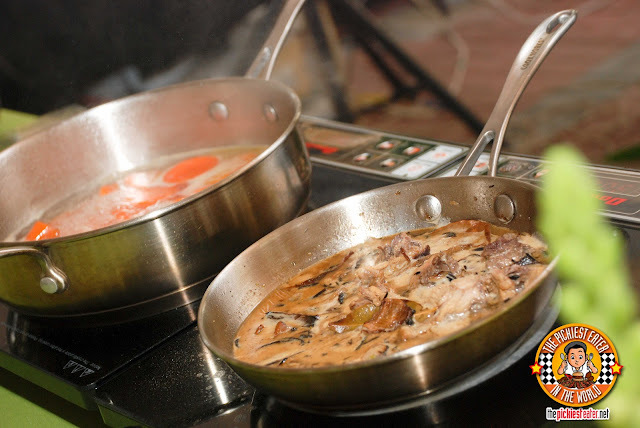 I'm glad I was able to taste the chicken dishes by a world class celebrity chef, giving me two different styles of cooking to choose from. When it comes to chicken nowadays, I'm usually relegated to two choices: Original Recipe or Extra Crispy. but TWO dishes from ? I went all fan boy again! Rina, in turn went all fan girl as well! 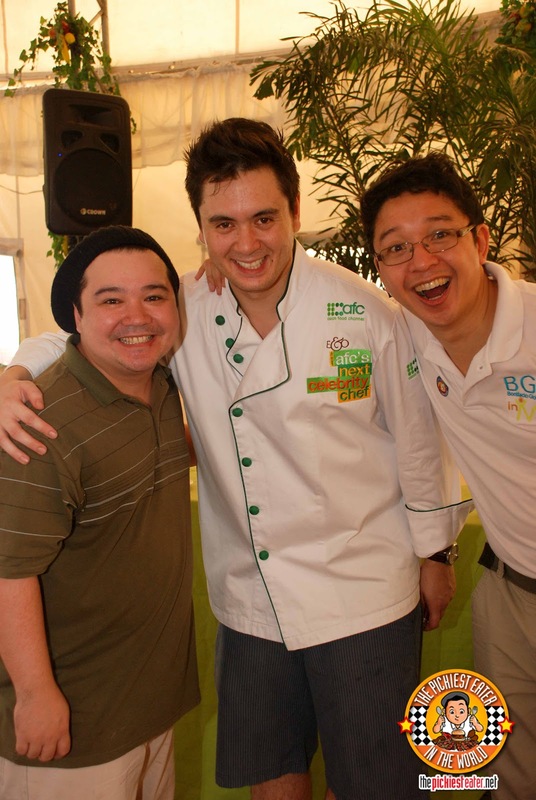 One last picture.. Goofing around with Chef Dino and Rj! I can't comment on food. 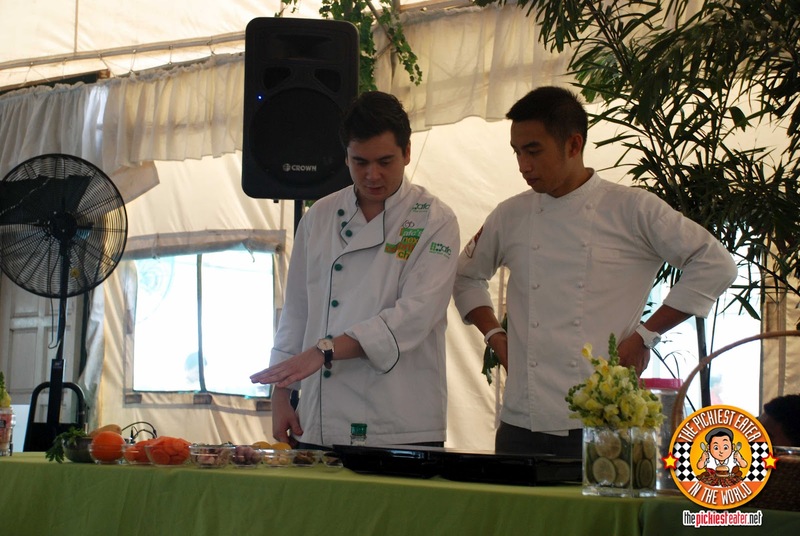 I was staring at Chef Dino the whole time.hahaha. Haha im not gonna try to convince you but..
all you would need to do is tweet him..
Hi Richie! 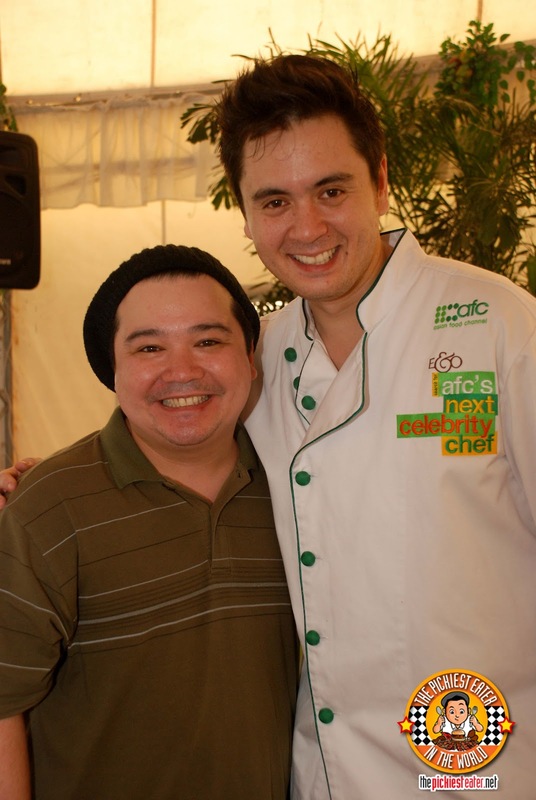 On your photo with Chef Dino, you were giddy weren't you? (I think, haha!) And btw, I love Adam Richman!!! I love men with a good sense of humor! Ana, I'm not ashamed to admit that I was giddy as a.. well.. umm.. As a professional wrestler! I noticed that about women.. they are drawn to men with a good sense of humour.. *sigh*.. too bad there are so few of us..
What's with girls and chefs? Well, for one, the way to a lot of girls hearts is through food din! 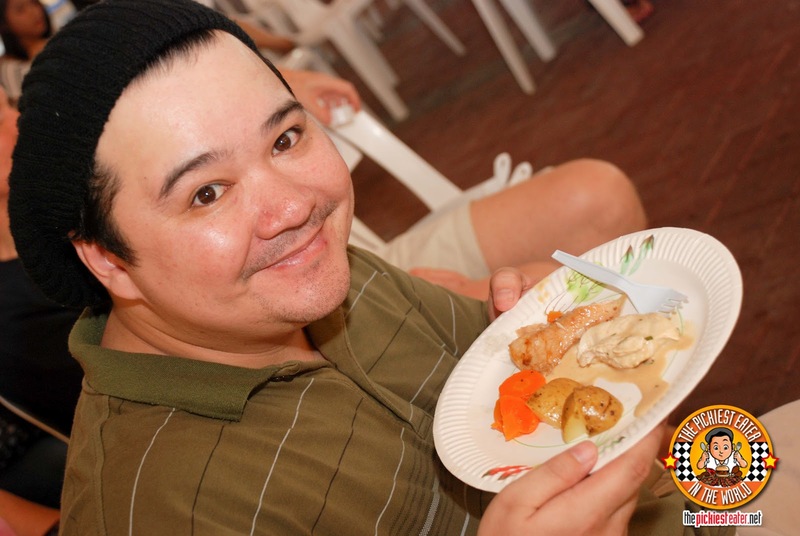 I like it when a guy knows how to cook -- and in Chef Dino's case, a guy who cooks well and looks good too! *swoon* So THAT's the big event happening when I walked by! Too bad I didn't stop to take a look! And I found that part about Rina leaving to follow Chef Dino when you left funny...but then I would have done the same if I were in her place. Lol! haha thanks a lot Clare!! I thought you were supposed to be on MY side! O.M.G..I still can't get over your intro. Gordon Ramsay and Adam Richman tweeted you??? Eek! I CAN'T BELIEVE GORDON RAMSAY TWEETED YOU. I'm sorry for the annoying caps lock mode, BUT I AM SO JEALOUS. And you are so funny talaga... 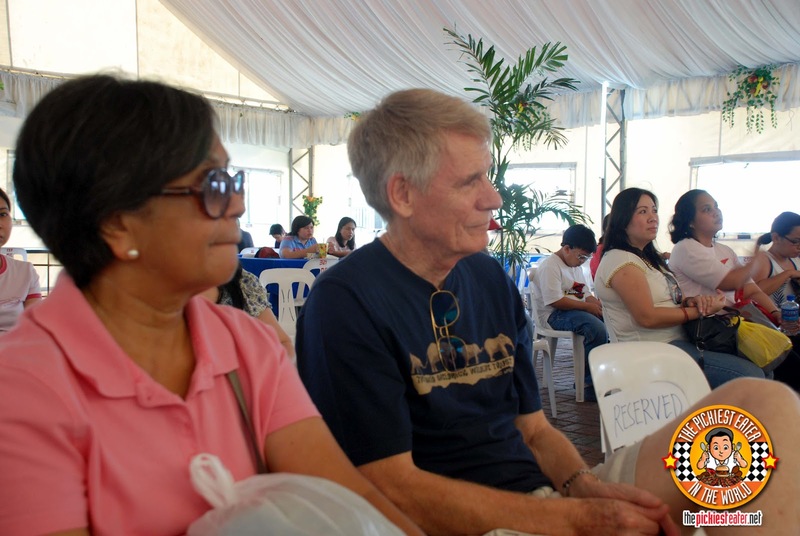 I have to agree with your wife, buti na lang you didn't name your baby "Bacon". Hahahahah! 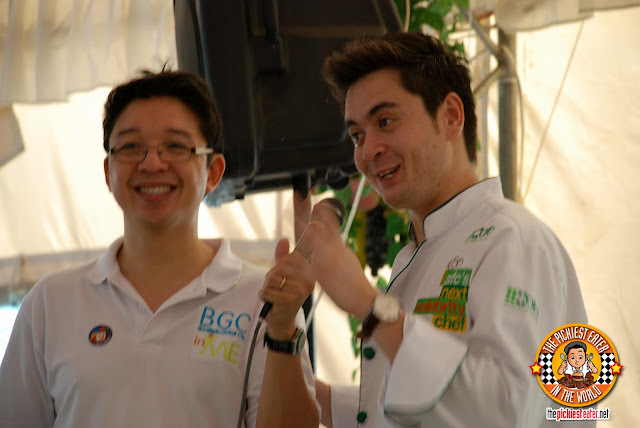 I have to agree with your wife again, cute ni Chef Dino. Even before reading your comments, that was on my mind already! All you women are teaming up against me!!! It's a conspiracy!!! Sayang you could've gotten free food! RJ was calling everyone from the outside to try it! 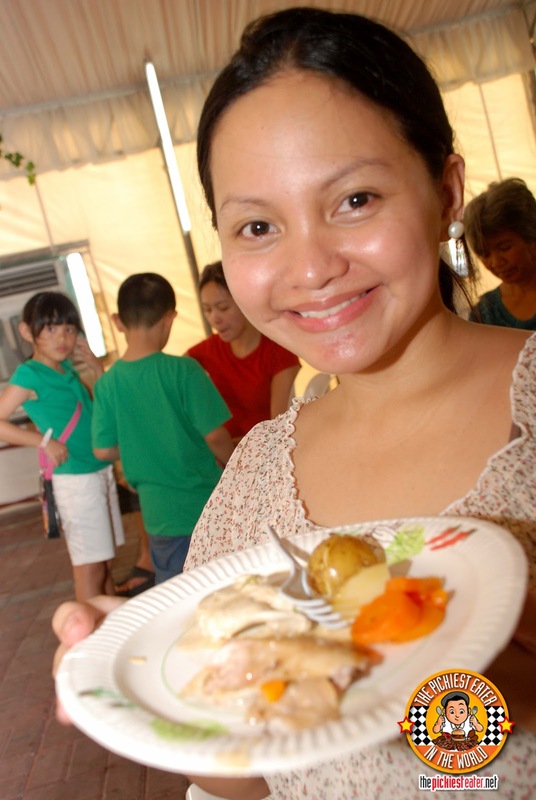 Haha syempre food celeb siya so natuwa ako! In that case, you're excused haha! Too bad you couldnt make it, Sumi!